Stencil a rug with flower stencils and garden theme stencils to add art to your floors! Plus free stencils and a fun video. Recreating a garden with paint is the best way to surround yourself with fresh blooms and bird song year round. 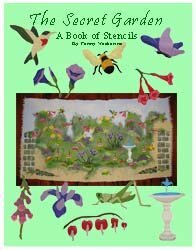 On this page you'll find free printable stencils, a great idea about creating a garden rug and even a video that will show you how I painted a garden mural with stencils. That’s right. We always think about art on the walls but what about the floor? It’s a perfect place to add color and what a surprise to your guest of having art under their feet. Maybe you have an old rug that needs help finding a new groove or maybe you have a blank floor space that could use a beautiful rug. Also, it’s a great way to add more of your personality to your home. Oh yeah! We now have a catalog for you to browse a large variety of stencils and you can find the designs used in this project at the Stencils Store (or just scroll down this page). Don’t forget that rugs define spaces. Stencil a rug with artful flowers to join two chairs and a table in one corner of a large living area to make a quiet reading spot. The rug used in this project was purchased at a Thrift Store (which is one of my favorite craft stores – plenty of ideas and raw materials). It had a couple of stains on it but no matter because the paint will cover them up, right? I brought it home and washed it very good in the washing machine. Since it started out white I used a little bleach. Just make sure that you use a rug that has very little texture or nap. You are looking for as smooth a surface as you can find so that your stencils can get close to the surface and make clean lines with the paint. Straw rugs are a good option too. To stencil a rug, I started by blotting on light blue paint on the top section of the rug and tan paint on the bottom half to create the sky and garden background. 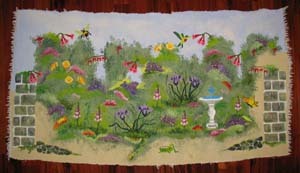 I covered the whole rug so that any areas I wanted to peek out from behind any garden resident would still have color. Also, the paint helped to smooth out my surface and helped the stencil process along. Yes, it took a lot of paint but I used the large bottles of craft paint that were inexpensive (the ones I don’t recommend with stencils because they are too thin and seep under the stencil). Let this layer of paint dry well (it may take some time). Oh yeah! Make sure you spread something under the rug before painting because the paint will seep through and stain the surface underneath. Then the garden and each flower stencils went on. You may want to take a few moments to plan where each stencil will be painted. For this project I actually framed the sides with the garden wall stencil and the bottom with the stone path. Then I just blotted on several different colors of green paint in the center to create the garden background. Don’t be scared of this part because it really was just that – blotting paint with a large brush in that area. It’s just a background and doesn’t need to be anything special because it will be covered up with the stenciled images. After that I just started placing stencils randomly around until I had a garden. 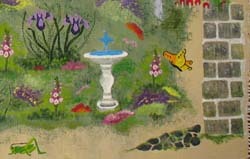 I used many different flower stencils with some bugs and even a fountain. (Pssst! Since you're interested in flower stencils I bet you'll love this Pineapple Stencil. It's another traditional design that works so great in home interior art and best of all, it's free!) You may want to stencil a rug with the pineapple for the kitchen. And don't miss these beautiful Rose Stencils. They may be just what you are looking for to stencil a rug for the bath or bedroom. If you need more instructions on stenciling, head over to How To Stencil to find anything from basic techniques to the advanced stuff. And if you get so excited about having art on the floors than don't miss this article on Stenciling Floors. Here’s a close up view of the painting. You may notice that around the stone path and garden wall stencil I dotted a little green for some moss. Also, when all the flower stencil patterns are in place, if you want to add a little more color sprinkle in some areas of colors like yellow and purple for casual patches of color. Again, don't fret this part because it's just dabbing a brush with some color in patches left open between your stenciled images. 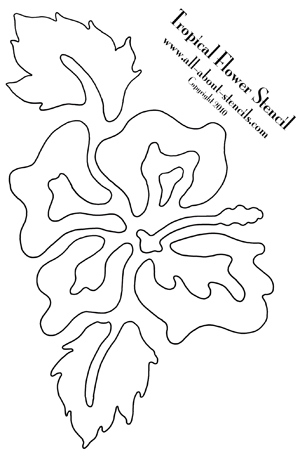 Since you seem to be into nature don't miss this article on Tree Stencils. You might be thinking of trees as a back drop for your flower stencil painting so this will be useful. Of course, you could just stencil a rug with the trees in one color onto of a solid background for a real simple but artsy look. Below is a sample of the Stencil Design books that we offer. This book includes the stencils used as examples on this page. Stencil a rug for your own private garden retreat. This collection includes 12 designs-fountain, bleeding heart, iris, bee, butterfly, foxglove, grasshopper, hummingbird, trumpet flower, morning glory, stone wall and stone path. 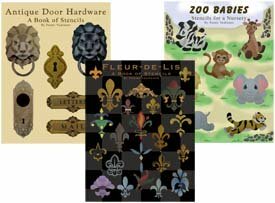 If you'd rather get your Stencil Pattern Books in Print (like these or the Secret Garden Stencil Book pictured above) then visit our Printer's Book Shop for a large variety of stencil collections. These books are easy to follow and come with complete instructions. You'll find all of the stencil designs used as samples throughout this site. It's fun to stencil a rug and you'll enjoy showing off this flower stencil garden rug. This project should get you thinking about all of the possibilities for designing art for your home. I hope you are inspired to create some great works of art with stencils! Well here's the video about creating Stencil Wall Murals that I promised you. Enjoy! And hey! Don’t forget that I (and everyone else) want to see what you have done to stencil a rug. So, join in on the Stencils Blog or Stenciling Projects to get your masterpiece showcased here. Won’t that be exciting! Well, I hope to hear from you soon. Oh wait! 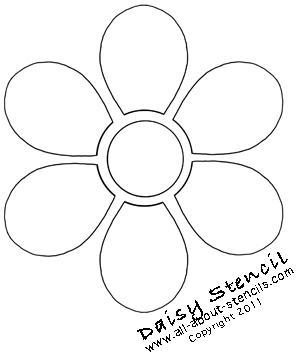 Here's one more free flower stencil! It would be cute to stencil a rug with the daisy for a teen's room. Return to Home Page from Stencil a Rug. Return to Stenciling Ideas from Stencil a Rug.